The rock, known as Ófeigskirkja, has been at the centre of an eight-year battle to stop a road being built through this 8,000-year-old landscape, a spectacularly barren and evocative terrain a little to the north of Reykjavík, which some believe is a site of supernatural forces. I am interested in what underlies these beliefs, or more subtly, a lack of denial of the presence of more-than-human land-dwelling entities. There is an interesting conversation to be had about the function that fairy tales and folklore serve in maintaining balanced relationships between people and the land. Many of us left behind the notion that the land is enchanted when we stopped reading fairy tales, if not before. Folklore stories must hold real currency and exert agency in Iceland if people continue to relate to the land in this way. Or, perhaps other stories that lead to a disenchanted view of the land never quite gained as much power as their predecessors… Stories have the power to hold together truths, just as they have the agency to disassemble them. I am not particularly tied to any story in this instance, I am more interested in which ones are BIGGER and hold people and place together in particular ways. It’s about respect for nature, which is something Icelanders know is very much alive … When your house can be destroyed by an earthquake, when you can can be blown over by the wind, when boiling water from your taps tells you there’s lava not far beneath your feet – then you don’t mess with nature. In Kópavogur, south of the capital, a rock known as Elfhill has caused disruption since the 1930s, when attempts to build a road through it were abandoned after a series of accidents. Plans to level the hill re-emerged in the 1980s, but problems recurred and workers refused to go anywhere near it. Even TV crews said their cameras failed to record anything when pointed at the rock. 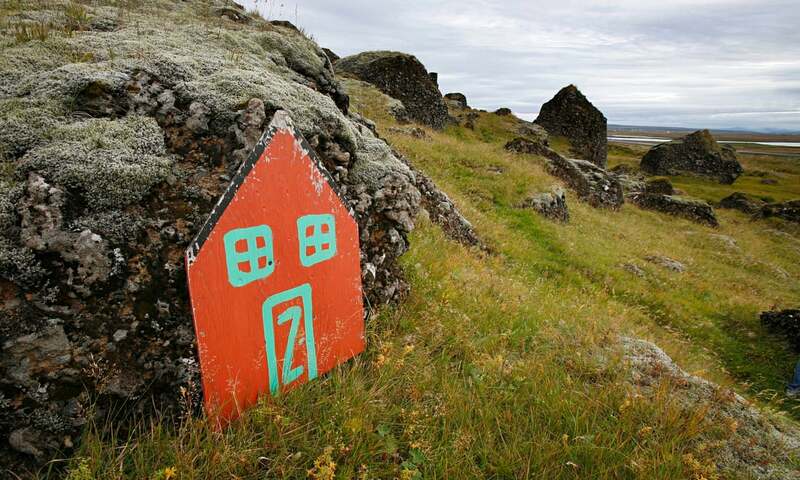 The approach now taken by some developers in Iceland is one of caution. In some way, the voices of the elves – who can literally be heard by some and interpreted through significant happenings by others – are being heard and the enchantment of the land is allowed to exist.